The idea of holding a concert for a small local audience and broadcasting it to a larger audience is not new. The Grand Ole Opry and Austin City Limits have been broadcasting live to radio for years. Shows like American Bandstand, MTV Unplugged, and VH1 Storytellers would often record the shows and broadcast them later on TV. Movies like The Last Dance, Rattle and Hum, Pulse, or The Woodstock Movie have given us a front row seat to some amazing concert footage, and a candid view backstage, albeit in 24 frames per second. Nowadays, teen stars like Justin Bieber and Katy Perry are releasing movies in 3D, including concert footage. You can also watch live opera performances in movie theaters, or simulcast to large baseball parks. The internet has created a new kind of live concert, where “concert go-ers” can stream the shows live to their laptops, smart phones or tablets. But who wants to watch a rock concert sitting in front of a tiny computer screen, listening to tiny computer speakers? Well, with a HDMI cable (and maybe an adapter), anyone can easily hook up their laptop to their big-screen HDTV, and crank up their living room speakers as loud as their neighbors will allow. Webcams have been around a while, but live online concert streaming in full HD is still relatively new, and many bands are reluctant to jump on the bandwagon, because they are also trying to preserve what’s left of the dying live concert industry. If a band plays a live concert on iTunes, Facebook, or Google+, are they sellouts, or simply adapting to a changing market ? Notice the website says “select video tracks”. The band realizes that an internet broadcast will not (and should not) take the place of seeing an entire Phish tour, but if the shows are sold out, why not let a few more people enjoy them online? Using a mix of experienced cameramen and video-conference style PTZ cameras, the 720p video stream and audio mix are as good as live, with only one or two digital glitches throughout the entire 3 hour+ concert. Each concert cost between $14.99 and $19.99, with 3-day packages available for $24.99-$39.99. Not exactly free, but much cheaper than a $60 ticket, a tank of gas, a cramped hotel room, and an out-of-state DUI. I encourage you to go to livephish.com, watch some sample videos in full screen, and judge the quality for yourself. TRI Studios – TRI (Tamalpais Research Institute) was recently opened by Bob Weir of the Grateful Dead as a purpose-built audio/video studio designed specifically for an online concert. There is a live studio audience of a hundred or so people at each TRI performance, which helps the bands feel like they are still performing at a concert, rather than for a broadcast. 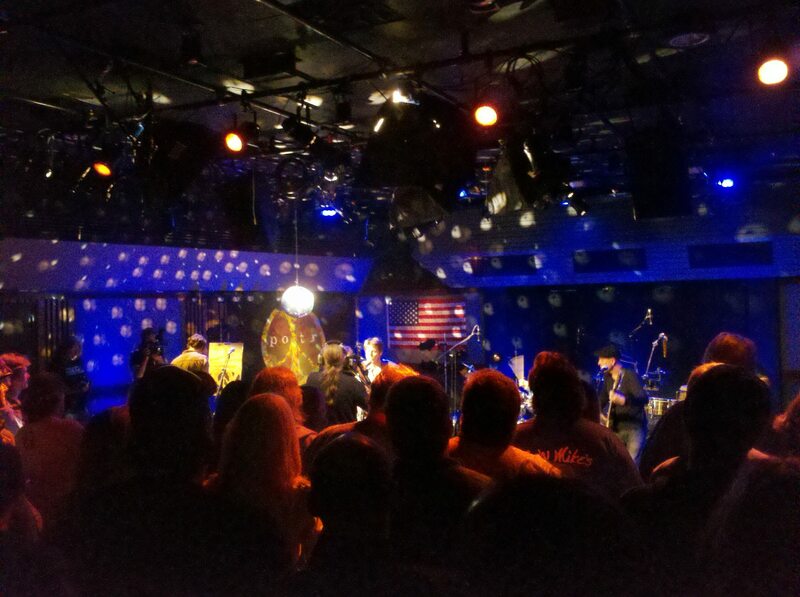 I was fortunate enough to attend a concert at TRI by Lukas Nelson’s band Promise Of The Real, where I was one of the studio audience members. First off, the local room mix sounded ‘Stella’, thanks to the Meyer Sound Constellation system installed in the ceiling, which allows variable reverberation times. The online mix is handled by a different engineering group in another room altogether. Since the studio is made for these online concerts, the video and audio quality is scary good, but the HD stream tends to lock up more than the other online concerts I have “attended”. Here is are some highlights from a recent Jerry Garcia memorial show at TRI Studios. The TRI concerts are free to watch on Yahoo Music, the cost is paid for through 30 second advertising slots before each show. Just like TV. The Yahoo Music video stream and audio quality were both good when I could actually get it working, but the stream kept dropping out, despite my business class internet connection. After Aerosmith, I could not get it to work at all. The concerts are free, but only if you sign up for a login to iheart.com; the costs are covered by annoying advertisements. Daria Musk – About a year ago, this Connecticut teenage singer/songwriter started using Google’s free multi-point video conferencing service (called Hangouts) as a way to play live concerts online. Her dedicated fan base (which she calls G+niuses) has now exceed 2 million people worldwide, and she has been featured everywhere from TED Talks to Rolling Stone Magazine. Google Hangouts allows nine lucky fans to have a virtual front-row seat to Daria’s concerts, talking to her between songs, talking to each other, and basically hanging out. Google recently added a Studio Mode button, which dedicates more bandwidth and different AEC algorithm better suited for live musical performances. Hangouts can now be simultaneously streamed to YouTube (note: Google owns YouTube). These Hangouts On Air allow an unlimited online audience to enjoy the concert. Daria invited certain friends to play their own songs (using their own studio mode button), and other audience members followed suit by teaching folk songs from their local heritage. Each time she would start a new song, Daria would ask the online audience to mute their microphones, a trick she learned early on in Google Hangouts to avoid echo and background noise. What is most amazing to me about the Daria Musk campfire concert is her ability to really connect with the online audience using minimal technology. Daria gets personal with each fan in the Hangout, welcoming them when they arrive, and saying a heartfelt goodbye when they “rotate” out of their “seats” to let other people join. There is no cost, no advertisements, no cameramen, no studio, no engineering, no broadcast truck; just Daria, RAM the bassist, and her brother, and millions of online fans. If you don’t have time to watch the entire concert, you should at least watch the first five minutes, and the last-minute when it starts raining, it’s really cute. What is your experience with streaming or watching live music events online? Please comment below, or email pkav.info@gmail.com. I’m sure most of my readers have been to a music festival of some sort. But if you haven’t had the pleasure of working a multi-day music festival, you are really missing out on some fun times. I haven’t worked live shows in years, and every time I attend a big festival, I kinda wish I was on the clock. The best word to describe working summer festivals is “epic”. It’s not uncommon for sound engineers and technicians to work three or four 20+ hour days in pounding heat and/or rain; wiring up ten or more bands on each stage, each day. Then pack up the trucks and do it again, that’s rock n’ roll, baby. Back when I worked these larger outdoor live music festivals, I was often the guy who made sure the microphones and DI boxes were placed and wired correctly for each band. “Check one, two” <- that was me. The festivals often had “big stages” and “small stages”, each with its own unique stage name coined by some underpaid marketing intern, and I would work all of them. (The stages, not the interns.) The big stages had bigger PA systems and bands, but the same festival “rules” applied no matter which stage you were working. If there were more than two or three bands on a given stage, only one band got to do any sort of sound check before performing. The rest of the acts just had to play their first song, while the Front of House (FOH) engineer scrambled to dial in the mix that the audience is hearing, and the monitor engineer tried to please the musicians on the stage, who often got their own mix. When I worked these festivals, both the FOH mixing console and the monitor consoles were analog, often matching Yamaha 4K’s, Crests, Soundcrafts, or Midas Heritages, each with the appropriate number of outboard reverbs, compressors, limiters, and gates, often used on drums and vocals, not to mention the racks of third octave equalizers. You literally had a knob, button or fader for everything, and the only things digital were the loudspeaker crossovers and maybe a new stereo reverb/delay unit. The lead FOH engineer and local sound crew on the stage would agree in advance to a festival input list that would cover 99% of all the bands microphones and instrument channels. Snare Top was always Snare Top and Snare Bottom was always Snare Bottom, all day, every band, all weekend. Spare inputs were always left open on the input list for curve balls thrown by the bands: visiting guest musicians, vocoders, or personal wireless headsets. The drums would sound great all day, because the same microphones, inputs, compressors, and gates would be used all day. Even if the bands were not sharing the backline drum kit (which saves a lot of time), the various drum kits would still sound good, with some sound engineers tweeking the settings slightly as the weekend went on. Each engineer could see the outboard gates and compressors working as the lights blinked on and off, and the previous engineer would tell the next engineer what was patched in where. Snare Top was Snare Top, and Snare Bottom was Snare Bottom. If you were unfamiliar with a FOH mixing console, or just rusty, it was easy enough to figure it out in a few seconds or a few questions. It was fun to mix on a different desk, you just had to find the knob, button or fader. It was all there, no surprises. Nowadays, with the advent of digital mixing consoles, the learning curve of each desk is a lot longer for an engineer. There is a much bigger fear factor when mixing on a new digital board, especially in a festival environment. The outboard pieces of gear have been replaced by digital compressors, limiters, and reverb that are built into the FOH console. The knobs and faders are shared between channels, which can can be easy rearranged so they show up in whatever order the engineer wants. The settings for each channel are often hidden behind other layers, so it is not obviously where the compressors, gates, and reverbs are set at. Some digital consoles offer automatic gain control and preset EQ’s for various instruments. Where is the fun in that? Most digital consoles now have the ability to save all the settings of your “mix” onto a USB memory stick (aka thumb drive) or SD card. Its not uncommon for a given band’s FOH engineer to start their day’s mix using a mix from an earlier performance, from the previous night, or a year earlier in the same venue. How lame! The biggest problem with this digital attitude is that you really don’t know where exactly you are starting your mix from. Its like making your own pizza, but starting with a mystery frozen pizza from a previous night, that already has sauce and cheese and toppings on it. 1. The FOH engineer for a particular band is familiar with the festival’s digital mixing console, so he or she pulls out a thumb drive with the mix settings from an earlier show, which was from an indoor venue, with a completely different FOH sound system and channel lineup. The gain and equalizer settings are way off, and oftentimes the inputs don’t match the stage wiring. 2. The band’s FOH engineer has never used the festival’s digital console before, or has very little mixing experience on it or any digital mixing boards. Working with the local system tech, the FOH engineer finds an old set of presets from a similar band, or just keeps the setting in the console from the last band. The FOH engineer has no idea where each channel’s limiter, compressor, etc. are set at, because the settings are buried on a different page or layer in the consoles Graphic User Interface (GUI) screen. The result is Snare Top is no longer Snare Top, and Snare Bottom is not Snare Bottom. One of them is now Trigger 1 and the other has been inadvertently phase shifted by 180 degrees. The snare drum sounds like crap for the first song, the second song, the third… In fact, it takes half of a show before the FOH engineer can find the bad setting in the digital console, which could have been located in seconds using an old analog desk and outboard reverbs and compressors. Am I referring to a particular live music festival? Yes. Did the problems continue to happen all weekend on the bigger stage with the fancy new digital console, adversely affecting the sound of each band? Yes. Did the smaller stages at that same festival with the analog consoles have these same issues? No. Did the smaller stages with the analog desks sound awesome all weekend. Yes. What is your experience using digital mixing consoles for all-day live music events? Please comment below, or email pkav.info@gmail.com.